We feel like we know a lot about the Sloop, but even the classification of "Motor Row" has been unclear to us. We know South Michigan Avenue is home to this area, but where does it start and end? Considered to be the largest and most intact early "automobile row" in the United States, the buildings of Motor Row illustrate the early 20th-century evolution of the auto showroom and related service buildings. Larger windows displayed the shinning machines in tall showrooms, while service and storage facilities were located on upper floors. In its heyday in the 1920s, as many as 116 different makers of automobiles were being sold on Motor Row. Parts suppliers, accessory manufacturers, and repair shops clustered nearby. 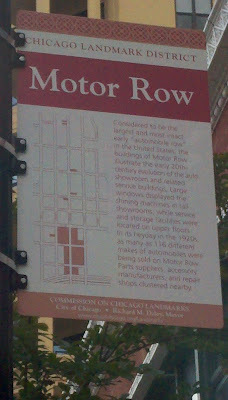 I really love the name "Motor Row". It just sounds cool, technical, and though... No offense sloopin, but I don't really like the term "Sloop" but your blog is the best South Loop blog so far. Anyway, I too thought Motor Row started further south, but now I can officially call say I live in "Motor Row"! Speaking of Motor Row, while the history is VERY interesting, the present/future is scary and uncertain. How in the world did this blog NOT cover the savage flash mob beating which took place just steps from historic motor row on Friday evening? 10-20 teens attacked one guy, stole his phone and wallet, and then brazenly walked up to the platform to flee on the red line. This is a major incident that should have been covered, especially since the beatings/muggings from last month were such a huge story amongst the followers on this blog. @Anonymous 8:28AM 8/22, totally agree with you and the term "Sloop". I don't like it either. It's the South Loop. Also don't like "SoLo". We are not NYC and this is not SoHo. But I love this blog! 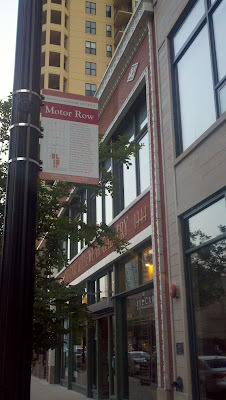 Motor Row is a great name for a neighborhood. Can you please elaborate on these incidents? I havent heard of this flash mob! What/Where? Apparently the attackers were all coming from a RAVE in a warehouse near the L? Anyone know where that is? It was on the Tribune site over the weekend. That's where I get my news. I don't expect the Sloopin site to cover ever little thing Anon 10:13am. Where does it say anywhere they were coming from a rave? Raves typically don't end at 10:30pm, lol. Listen, if only ONE sloop resident that didn't already know about this occurrence has now become aware of it based on this post, then it was worthwhile. Community safety and well-being is first and foremost in my opinion. Whether its one person attacked or five separate incidents - I want to know about it in order to be aware of the places and times of attacks. This last attack took place at 11 pm on a Friday! Not in the middle of the night. And the police report indicates that 5 people were arrested, while today's Tribune states that there were between 10-20 attackers; meaning quite a few are at large. Adding to the above, I've lived in the South Loop for the last 12 years, and have never heard the term "Sloop" outside of this blog. Do people really say this? "The victim dropped off his girlfriend and was in the area of 138 W. Cermak Rd. when a rave at a nearby warehouse let out about 10:50 p.m. Friday, police said. A large group of males took the victim’s cell phone and began beating him up on the street with their fists and hands." You can draw satisfaction from a few aspects of that story of the Cermak El Stop. #1, all arrestees had north side addresses. #2, the security folks on the platform detained and held the arrestees for the police. Weird historical tidbit to randomly add here. In the 1920s or so, two Chicago police officers shot each other to death on Cermak by the El platform. One was an inspector affiliated with one bootlegging gang, and the other a lowly PO affiliated with another. They saw each other on the street and opened up, or something like that. That's the kind of historic Chicago trivia my husband loves... What was your source(book), so I can get it for him for his birthday? Can we at least get a description of the perpatrators? Mug shots perhaps? I think it was in either Return to the Scene of the Crime, or To Serve and Collect. Haven't read either of em in a decade, but I remember the story. Lots of crazy stories in each. Somewhere or other, maybe on the Northwestern homicide page (http://homicide.northwestern.edu/), I also remember reading that a PO was shot to death on the Roosevelt platform in the 20s or 30s. Always wonder if people ever think about what happened in their space before they were there! I might be misremembering the story. After checking google books, the story of Sergeant Stanley J. Birns is told in To Serve and Collect. Sergeant Birns was killed by an inspector of the morals commission (non-CPD) on 22nd street in 1914. Thought I heard a story that was more than this, but this sounds like the account I remember. Anyway, both of the books noted above are worth buying for a Chicago history buff. Motor Row Historic District is between 14th and Cermak. Actual Record Row runs from Roosevelt to about 25th Street, and was the home of legendary music activity from jazz, blues, gospel and soul for decades. While it may be cool to live in "Motor Row", "Record Row" would result in more visitors to the street between Roosevelt and Cermak, as few others care about the topic. The Alderman is trying to build Cermak between the expressways as Record Row, but that makes no sense, that is not where it was. Many foreign and music tourists would walk the way marked Record Row with such signs and perhaps a couple of preserved buildings like Chess and VeeJay. Cermak needs a strong connection to Roosevelt to extend the zone of safety and perceived safety of Museum Campus. So I don't know if I agree this was the best way to go. Roosevelt to Stevenson should change into Music and Motor Row Historic District (under one umbrella); as long we ACTUALLY develop more restaurants, boutique hotels, bars, rooftop and patio seating. Visitors will not care what we call the area (in reality they will be informed that there is an area in Chicago to visit that has a music and auto rich history). I would love to see the area developed into a music/motor row district, but I have a feeling it's destined to become a chain mecca. It's Record Row, not Music Row, that is how it is known all over the world by those who know it, fans of Chicago blues, gospel, jazz and soul music. Again, no one from out of town gives a rats about Motor Row. So I hope Fioretti left room for the Record Row signs on Michigan Ave. If something is not done to connect Museum Campus to Cermak, you can forget about attracting anyone except conventioneers from McCormick Place. It is just too boring for people, as someone commented in the Suntimes recently. We need something, again, to extend the zone of safety, I think recent crimes show. I remember when it was considered risque to go south of Harrison. There are various music history projects proposed for South Michigan, so I don't know why he would not want to capitalize on that. Right now it's more like Skid Row. Thus, why are we all fighting over "music" vs. "record"? Instead, we should all be absolutely hounding the alderman to do something NOW with this area, because once property taxes DOUBLE in 2014 when the freeze expires, absolutely nothing is going to happen.